I’m coming to terms with the fact that this will likely be my last bite of butternut squash for awhile, which makes me a little sad. Is it weird to miss vegetables? Wait, don’t answer that… My husband on the other hand does not share my nostalgia for these peculiar-shaped roots. As the “chopper” of the household, he’d be happy if he never came head to head with one of these guys on the chopping block again. They sure are little boogers to get into, but man, it’s so worth it. That buttery flavor and heartiness make them the perfect healthy comfort food. Plus with their dye-your-skin-orange flesh they’re chock full of antioxidants to keep your immune system in tip-top shape, just when you need it the most. Literally, all I did here is saute sliced red onion in a skillet. Add the squash. Then broth. Then kale. Then beans. Serve over quinoa and voila! You’ve got yourself a dinner that might make you miss b-squash too. It’s crazy healthy, and even crazier that it’s so delicious. I almost can’t believe it myself. Here’s the full recipe…. Rinse and drain quinoa well. Bring 2 cups of salted water to a boil and add quinoa. Reduce heat and simmer 15 minutes until all of the water is absorbed. In a large skillet, heat olive oil over medium heat. Add onion and saute until translucent, about five minutes. Add squash and stir to coat with oil. Cook 7-10 minutes. When the edges of the squash begin to sear and stick to the pan, stir in the vegetable broth. Cover and simmer about 10 minutes. 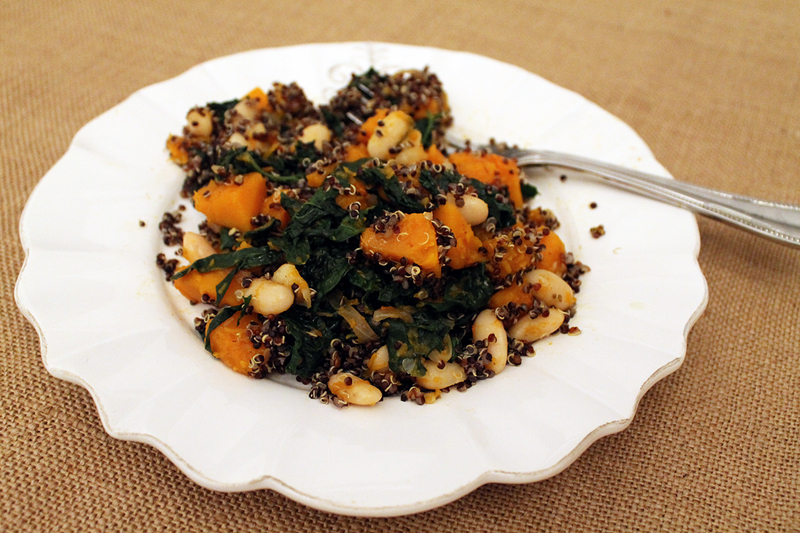 When the squash is soft, add kale and stir to combine. When the greens have reduced, add white beans and stir to combine. Serve over quinoa; drizzle with lemon dressing. And enjoy that last taste of winter. Sign me up – I need a good spring cleaning– Thanks Megan, you are awesome! !